It’s hard to believe with the frigid weather still going on in most of the U.S. that Spring is just around the corner, and the Easter bunny will be hopping down the bunny trail. 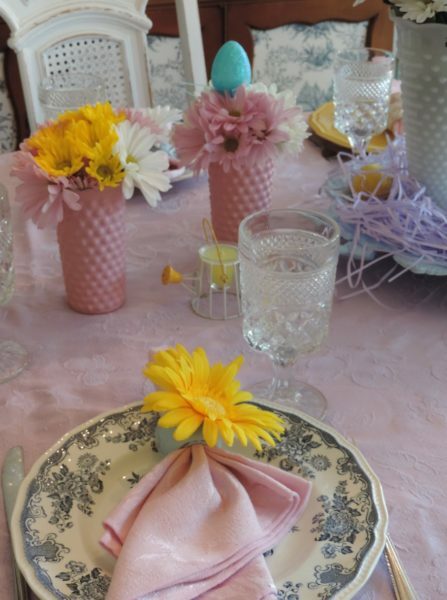 Today I wanted to brighten your day with a few pretty pastel Easter tablescapes that will have you dreaming of the warmer weather. 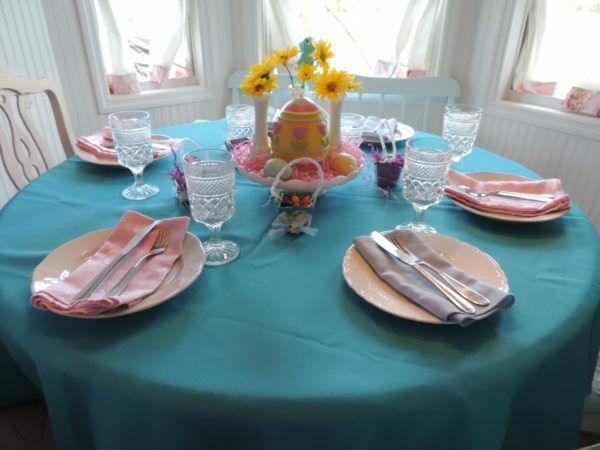 This first Easter tablescape began with a lively turquoise and yellow gingham check fabric tablecloth. 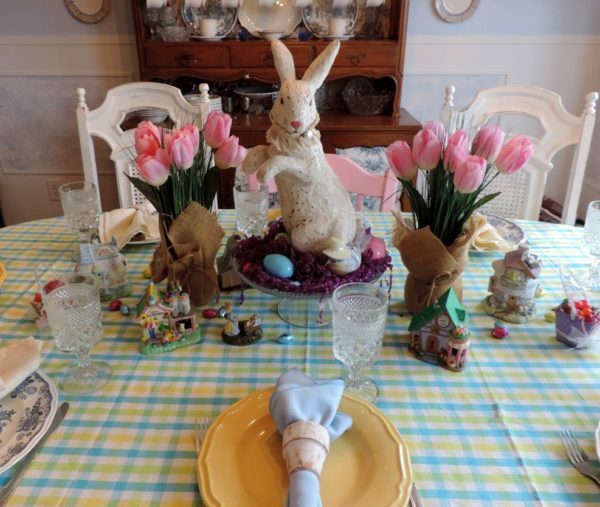 A collection of Easter village houses, pink silk tulips, a bunny centerpiece and Easter candy sets the tone for a whimsical garden inspired Easter dinner table. Each place setting features a cute whitewashed terracotta pot napkin ring! 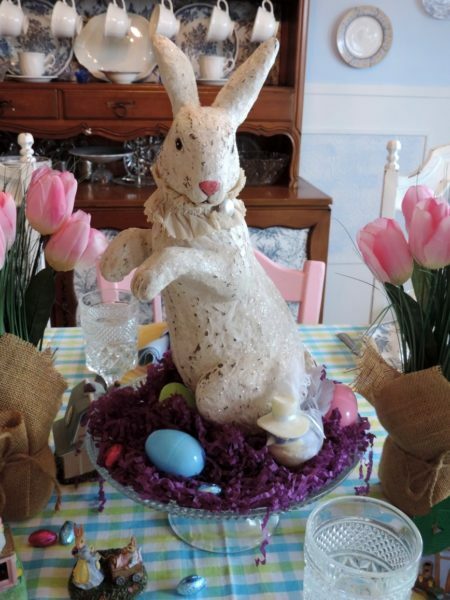 A large vintage inspired papier mache rabbit takes center stage as this Easter table’s centerpiece. 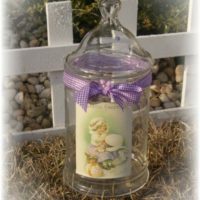 I placed it on a glass cake stand in a nest of purple Easter grass for added height. A few plastic Easter eggs completes the look. These jelly bean filled, handmade vintage inspired Easter candy cups are scattered around the table as a sweet treat for guests to enjoy. 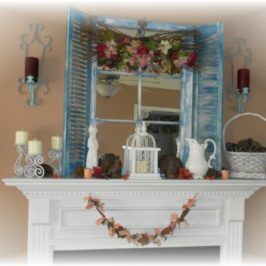 I love decorating with vintage elements and Easter is no different. I absolutely LOVE vintage milk glass and have collected quite a few pieces over the years. 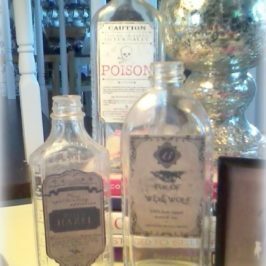 Normally they sit idly by on a shelf waiting too be noticed and enjoyed so if I can put my milk glass collectibles to good use I will jump at the chance! 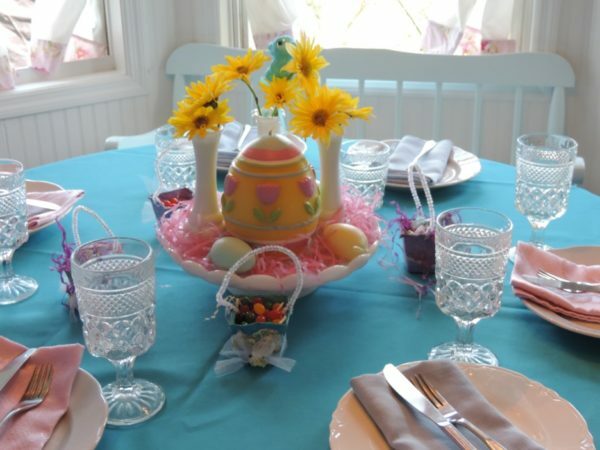 On this Easter table the main focal point is the centerpiece. I used a painted vintage silver tray as the base for this Easter centerpiece. 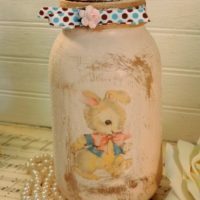 My vintage inspired Bunny and a vintage milk glass vase filled with store bought daisies complete the look. 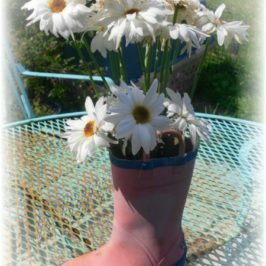 The small floral arrangements scattered around the table were created from more daisies and vintage glass hobnail drink glasses that I painted a soft pastel pink. I think they are super cute! This pretty pastel inspired Easter tablescape features elements in lilac purple, light blue and pink. The yellow daisies add a pop of vibrant color to the otherwise muted color palette. 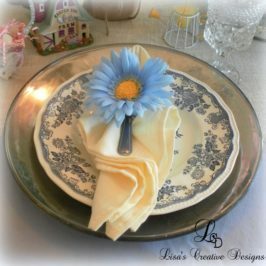 Vintage glassware, dishes and a bright turquoise tablecloth make up this next Easter tablescape. 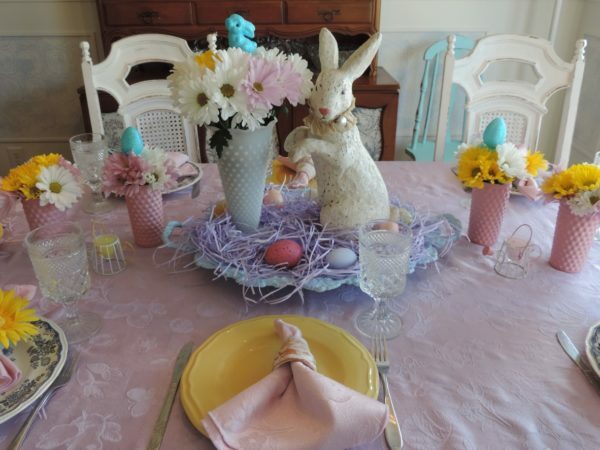 The center of the table features a vintage milk glass cake stand with a large Easter egg candle and vintage milk glass bud vases nestled in Easter grass. 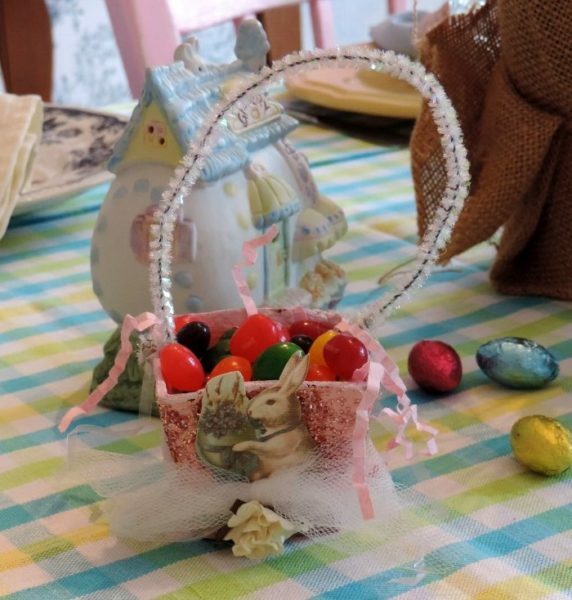 I also put a few vintage inspired Easter candy cups filled with jelly beans on this table as well. 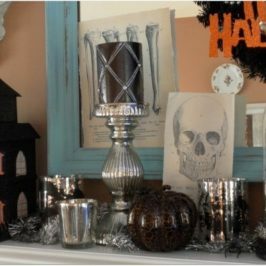 Here is another centerpiece option for the same table. I love these vintage milk glass hobnail vases. Adding fresh flowers can freshen up any table! 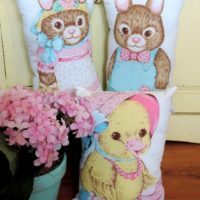 The sweet vintage velvety Easter Bunnies and Chick were thrift store finds. They remind me of Easter at Grandma’s house when I was little. 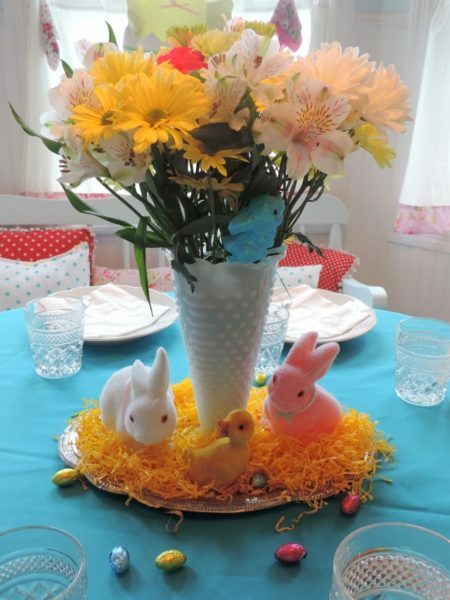 I hope these Easter decorating ideas inspired you to decorate your own Easter tablescape! I love all your vintage pieces. 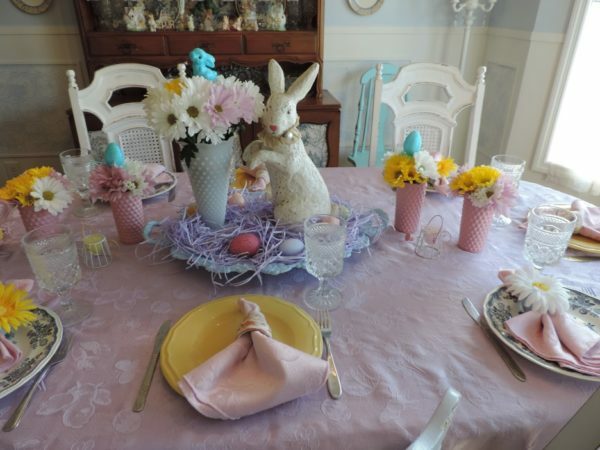 The bunny and the milk glass are perfect for your pastel Easter tablescape. 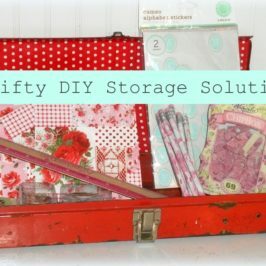 Stopping by from the #HomeMattersParty linky. Thank you so much. I hope you had a wonderful Easter!